Have you entered my giveaway yet? If you have, then this is one of the polishes you could win. 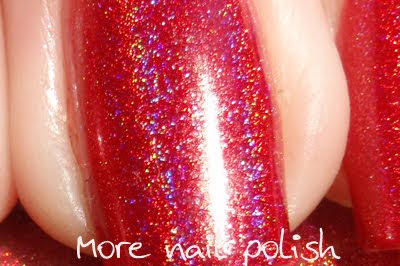 This is the Artform Red Holographic polish. The holographic effect in these polishes is very sparkly, and sort of linear. They are not like the China Glaze Kaleidoscopes (scattered holo) nor are they like OMG or Nfu Oh (linear holo) In fact they are both scattered and linear in appearance, most like the OPI DS series (think Original and Desire). This polish is the closest I've seen to a true red holo. 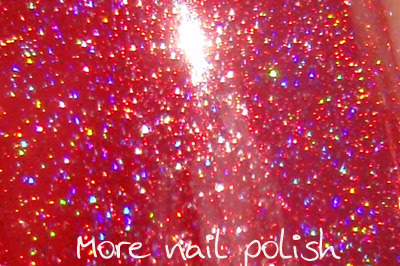 I know Glitter Gal do a strong red holo called "Not another red", but many of the swatches I've seen show it looking rather pinky. This one also leans a little pink, but generally is a pretty good red holo. As you can see this has a decent amount of holo goodness.